Have you ever wished that you could carry a handy little antenna around with you that would just sit on the window ledge in the hotel and be ready to use the instant you connect it up to your rig? Well this may be the answer that you have been looking for it's called an EH antenna and is based on an idea's by Ted Hart, W5QJR and Maurice Hatley. This particular little wonder is not going to put out masses of power as it stands but it is surprising how well it works. I made this one based on a design by F5SWN and it only took about an hour or so to make, you can even enjoy yourself whilst you a preparing the materials as you use a beer can for the two radiating elements at the top of the antenna. 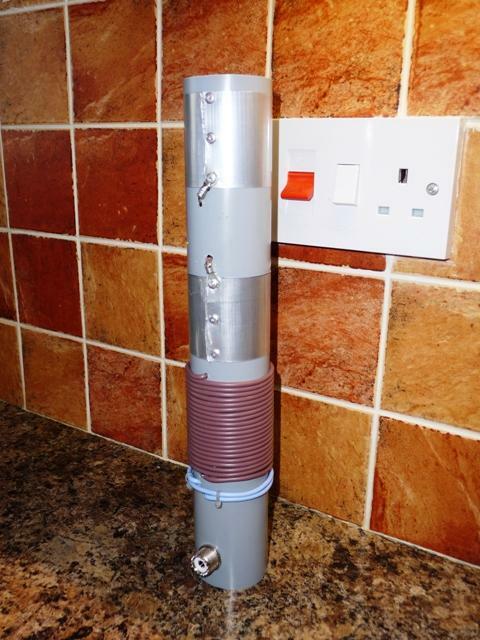 if you are interested in making one have a look at F5WSN EH Antenna link. he gives designs for various bands. you will be amazed by the results if you do make one, both John 2W0OSG and myself have made them and are very pleased with the results.